The Rt. Rev. E. Don Taylor, former Episcopal Bishop of the Virgin islands. It is with sadness that we share news of the death of the third Bishop of the Episcopal Diocese of the Virgin Islands, The Rt. Rev. E. Don Taylor, who died in New York on Saturday, May 23rd at the age of 77. A Jamaican, Bishop Taylor was ordained a priest in 1961 and served in that capacity for nine years before being appointed Headmaster of his alma mater, Kingston College. In 1973 he moved to the United States, serving in Buffalo and Atlanta until 1987, when he was elected Bishop of this diocese, becoming the first West Indian to reach the rank of Bishop in the Episcopal Church. Bishop Taylor was well-loved in the Virgin Islands and could often be seen walking the streets of Road Town. His good-humoured declaration that as diocesan bishop he was a shepherd to everyone in the territory, regardless of religious denomination, was warmly welcomed. Trained as a broadcaster, his voice became a familiar one through his weekly programme, “Our Bounden Duty”, which was heard on ZBVI Radio on Sunday mornings. In 1994, Bishop Taylor returned to the United States mainland to assume duties as Assistant Bishop in the diocese of New York, in the newly created position of Vicar Bishop for New York City, an area covering Staten Island, Manhattan and the Bronx. There too, he was welcomed for his pastoral ministry and his commitment to promoting community development. After his retirement, he returned to Jamaica in 2009 to serve as rector of the Church of St. Thomas the Apostle, popularly known as the Kingston Parish Church. 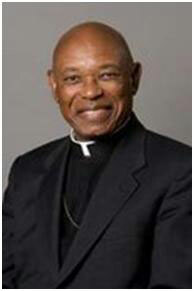 Bishop Taylor became ill late last year and, in February, returned to New York for medical care. He is survived by his daughter, Tara-Elizabeth. A funeral service is scheduled for the afternoon of Wednesday, June 4th at the Cathedral of St. John the Divine in New York City.